I have to confess that I have a problem. Actually, it wasn’t a problem when my habit went unnoticed by my son. However, now that he is 5, nothing I do escapes his watchful eye. Much like Halloween, my son meticulously counts his candy booty that he collects from the Easter eggs he had worked so hard to find. This year, he acquired quite a huge stash of chocolate eggs, lollipops, peanut butter cups, and of course two chocolate bunnies. Every now and then, when he would check his stash, he would notice a missing ear or toe on his chocolate bunny and wonder who would do such a thing. And as the good parent and role model that I am, I would confess to nothing and without any proof, my son couldn’t be certain who had done it. 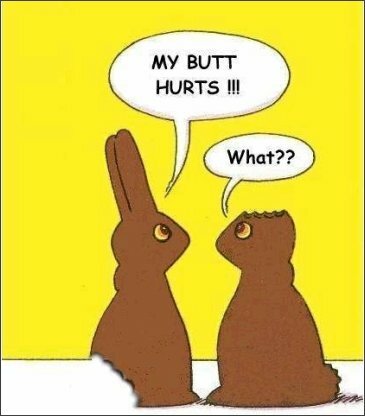 Well, last night I couldn’t help myself and I downed the last chocolate bunny. My mistake was that I forgot to throw away the box. It was all the evidence my son needed to convict me, saying, “Mom, I know it was you who ate the chocolate bunny because you eat a lot of candy.” Oh, my son knows me so well. The act of “seeing” has much to do with our own perception, whether it has to do with what we perceive we are seeing or what we perceive we understand. In a time when we can’t benefit from the physical evidence of Christ’s resurrection like Thomas, we rely on symbols, rituals, and signs that we perceive are evidence of Christ’s presence. As Christians, we feel called to live our lives like Christ, making this world reflect Christ’s love, hope, and forgiveness. However, much of what we see in the world or experience in our lives seems to be the opposite of that, making it hard to believe in the Easter message that Christ is truly alive. For example, when Dwight wanted to capture two butterflies hovering over a flower, this is what the camera saw . . .
and after using Photoshop, Dwight was able to share what he saw . . .
Much like how Dwight used a tool to manipulate change in what was captured to what he perceived to see, we as Christ’s followers are called to do the same. We are called to be agents of change, doing what we can, using our God-given talents and passion to change this world so that it reflects the way God intended — feeding the hungry, healing the sick, clothing the naked, befriending the lonely, and nurturing the child. How we do that depends on who we perceive God to be and how we perceive ourselves participating in God’s creation. In July, the Presbyterian Church U.S.A. (PCUSA) will hold its 219th General Assembly in Minneapolis. General Assembly is held every two years, where 712 elected elder and minister commissioners gather to deliberate and discern over how our denomination is to engage in matters of the world that reflects God’s intent and purpose. Pastor John will be attending as he advocates for an overture that will declare that the State of Israel is committing the crime of apartheid against the Palestinian people, an issue that he is quite passionate about. I will be attending as well as a minister commissioner representing the Presbytery of San Francisco and as moderator of the Social Justice committee. As we gather, there will be moments of solidarity as well as disagreement for we all have our own perception of God’s will for PCUSA. But we come as faithful people, who are willing to engage in discussion and action on what direction PCUSA will move. How do you perceive God’s call in your life? How will you participate in making this world a better place for not only your family, but for those around us? What God-given talents will you share?